The global smart irrigation market is intensely competitive, which is expected to up over the years, finds Transparency Market Research (TMR). The pace of new product developments and innovations in the global smart irrigation market heavily influences the contours. A majority of players in the global smart irrigation market consider spending on research and development activities as a worthwhile strategy to strengthen theirs shares in the global smart irrigation market. 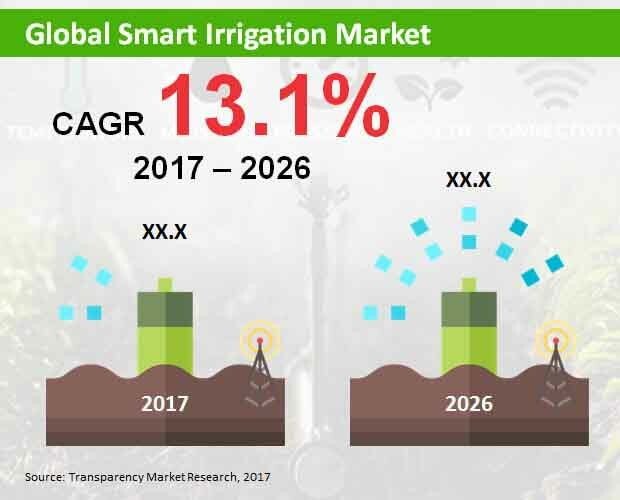 Top players in the global smart irrigation market include Telsco Industries Inc., The Toro Company, Rain Bird Corporation, Orbit Irrigation Products Inc., and Rachio Inc. The growing number of mergers and acquisitions in the smart irrigation market in various parts of the world is a key trend expected to escalate competition. The global smart irrigation market is projected to reach a worth of US$2.32 billion by 2026 end. The market is predicted to register at an impressive CAGR of 13.10% during 2017–2026. Among the various types of components, smart irrigation controller systems account for a prominent sales share in the global smart irrigation market. The segment is expected to account for a sales worth of US$900 Mn by 2026 end. The prominence is attributed to the rising role of controller systems in smart irrigation. On the regional front, Asia Pacific excluding Japan (APEJ) is expected to rise at the most attractive year-over-year growth over the assessment period. This is attributed to the rapid uptake of various smart irrigation technologies in several of it emerging economies. The global smart irrigation market is driven by the need for bringing advancements in food production in various developing and developed regions. The intensifying need for reducing the reliance of agriculturists on rainfall for water needs in irrigation in developing economies has offered a big momentum to the growing significance of such technologies. In addition, rising need for minimizing excess water use in the agriculture sector is expected to bolster the need for smart irrigation technologies. These technologies enable agriculturists to monitor soil temperature and soil moisture, which helps in correctly estimating water needs of plants. Furthermore, the demand or smart irrigation systems is propelled by growing awareness about several long-term benefits of smart irrigation on soil quality and agricultural yield. The global smart irrigation market is expected to garner a large gain from the rising adoption of an array of wireless communication systems and sensors. Constant technological advances in networked sensors and microcontrollers used in smart irrigation systems are anticipated to boost the market. Substantial adoption among agricultural professionals world over is expected to accentuate the growth. Limited awareness among consumers pertaining to benefits of smart irrigation technologies and the high cost of installing the equipment are factors hampering the uptake. Nevertheless, the smart irrigation market has witnessed new, exciting avenues in the integration of the technologies with internet of things (IoT). Moreover, substantial advances made in communication technologies used in smart irrigation systems have opened promising avenues in recent years. Furthermore, the advent of easy-to-manage and intuitive technologies for farmers is expected to boost the smart irrigation market.